This is the third version of the successful "Jericho" all over the world. From the first day that we started making guitars we knew that our next project will be to find the way to make easier life for guitar players. 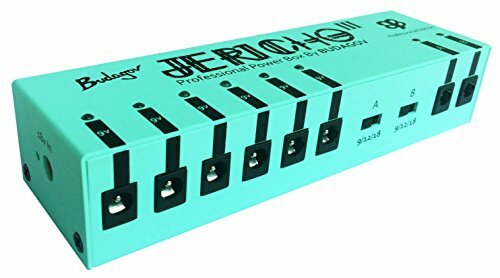 The "JERICHO-III" is a new power supply that gives you 8 power outputs for your effects with different voltage. It is an ideal product and maybe the first real "MUST HAVE" accessory for session guitar players and stage performers. You are going to be surprised how quiet and clean your guitar sound can be even when you are using a decent guitar effects chain. Extremely versatile power adapter for the professional guitarist. Two versatile outputs A+B for your choice 9/12/18V differ by switch 500mA each . 18V 2A Input. 8 X Dc power cables (center negitive)included. 1 X Polarity Reversal Cables included. SHORT-CIRCUIT PROTECTION All 8 outputs in this unit have separate short-circuit protection, i.e. short circuit in one Channel won't affect other channels function. Special - one of a kind versatile power adapter with 2000mA for almost any standard configuration! Adapter and all power cables necessary are includeded!!! If you have any questions about this product by Budagov Guitars, contact us by completing and submitting the form below. If you are looking for a specif part number, please include it with your message.